Kirkland, WA — Real Time Integration, Inc. announced today the addition of distributed time synchronization software to its NetAcquire product line. NetAcquire is a standalone data acquisition computer that acquires, processes, and updates real-world signals, and transfer this data to and from any network. When real-time data is collected from many points on a network, it is often important to accurately correlate time stamps of incoming data. The NetAcquire Time Server module uses Network Time Protocol (SNTP) to maintain a highly accurate and synchronized clock. The time protocol uses a reference server to distribute accurate time across the network to one or more clients. The time protocol incorporates sophisticated algorithms to eliminate the effects of network delay and jitter, and offers typical timing accuracy of 5 milliseconds on a local area network. NetAcquire offers three options for time synchronization. In the first, all nodes are synchronized to the internal clock of a master NetAcquire server. In the second, all nodes are synchronized to external satellite time, as acquired from a NetAcquire with GPS antenna option. In the third, all nodes are synchronized to an external Internet NTP primary time standard. The timing drift of each local NetAcquire clock is computed in real-time. If the central time server machine becomes unavailable, this local drift is used to continue making corrections to the clock until timer server connectivity is restored. The timing offset and drift parameters are also stored in non-volatile memory to protect against power failures. 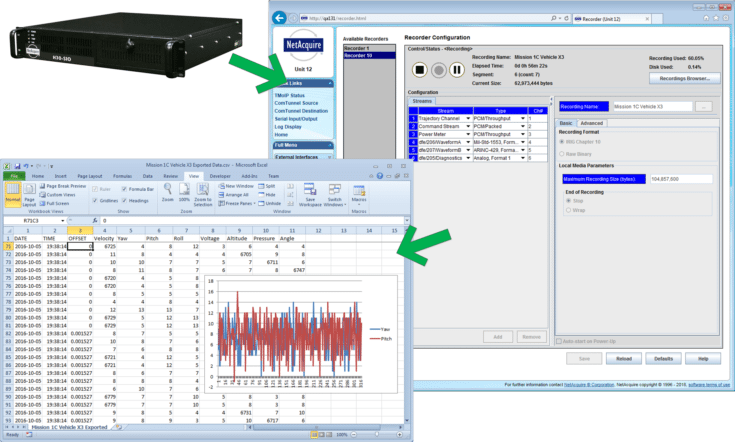 The NetAcquire Time Server module will be included on all NetAcquire platforms with software versions 3.0 and above.